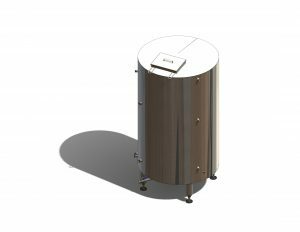 Non-pressure heat-insulated treated cold water tank ZUPV is made of stainless steel AISI 304 and is designed to collect treated water, cool the water and its subsequent use for the cooling of the mash. The heated water from the wort cooler then goes into the hot water tank NHV. Water is cooled by the spiral exchanger inside the ZUPV in which the glycol ice water circulate from the ice water tank ZLV (ZLV tank is not included in this component). 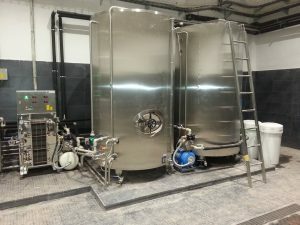 The ZUPV tank is also fitted with a Willo circulating pump, which is used to homogenize the water temperature in a vessel with very low power consumption. For measurement and automation purposes, the container is fitted with a PT100 temperature probe and a pair of MAVE level sensors. The ZUPV tank also includes a pump with an expansion vessel and Presscontrol pressure switch.